Every dessert table at a BBQ deserves a pie (or 2 or 3). I used my mother-in-law’s pie crust recipe for the one millionth time (give or take). Seriously, this is the only pie crust recipe I’ve used and I have no reason to go looking for another because it’s delicious and so easy it’s basically fool-proof. Flaky and delicious and easy. Just perfect. 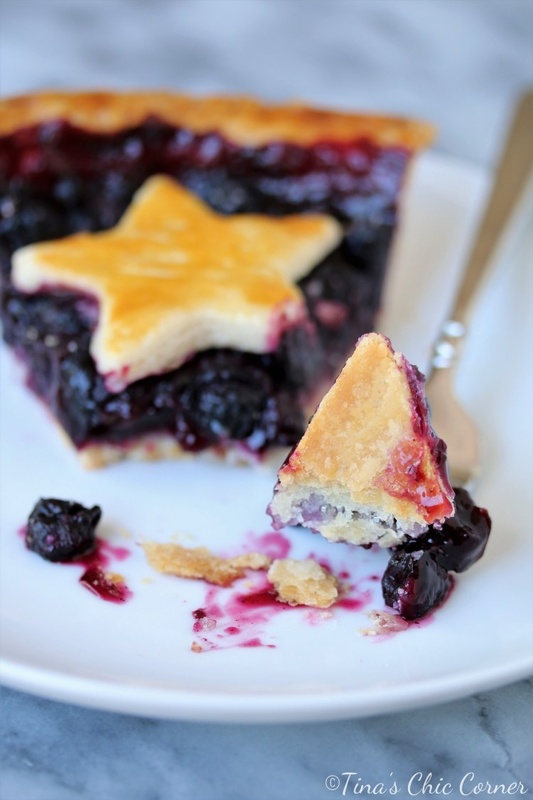 Usually I make this blueberry pie without a top crust. However, this time I felt inspired by the stars and stripes theme to add some stars on top. Unbeknownst to me, I apparently had the same inspiration last July too because I did the same thing for my triple berry pie. Here I thought I had an original idea, but nope. Whomp, whomp. Maybe it will become a tradition now. Accidental traditions can still be traditions, right? 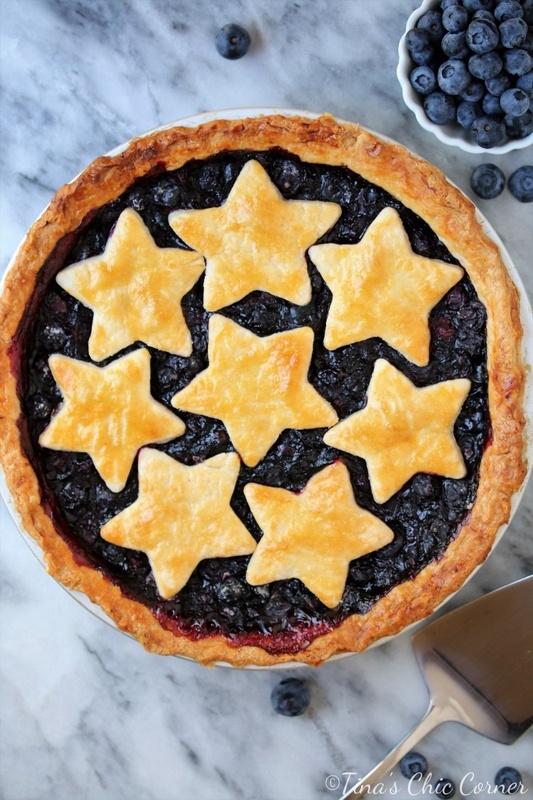 I apologize in advance if you want to make the pie stars and think that they’re annoying since you have to bake them separately from the pie. 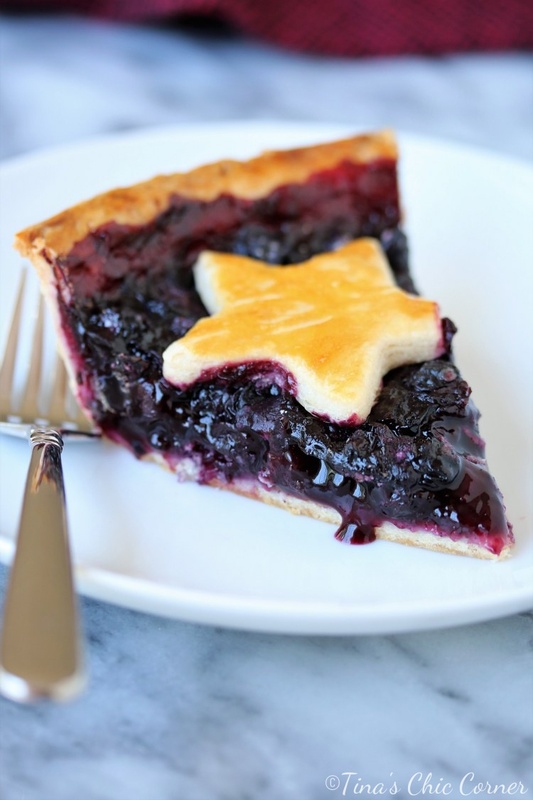 The directions for my blueberry pie assumes that there is no top crust so if you add one (or cute shapes) then you would need to alter the cooking time and/or oven temperature, otherwise the top crust would likely burn. Truthfully I don’t want to mess with the original recipe because I know I’ve got a good thing going. If you end up experimenting with the time and temperature to adjust for adding a top crust let me know. I love learning from you all. Add in 4 tablespoons of very cold water and mix together until the dough is moist and comes together. I use a fork for this step because I find it is easier to mix than with a pastry blender. Add more cold water a few drops at a time, if needed. Gather the dough into a ball and wrap it tightly in plastic wrap. Chill the dough for at least 30 minutes. Wash the blueberries and make sure that there are no pesky little stems or super weird looking berries. Dry off the blueberries, pour them into a large bowl, and then set it aside. In a small bowl, whisk together the white sugar, cornstarch, salt, and cinnamon. Pour the sugar mixture into the bowl of blueberries and gently mix it all together. At this point preheat the oven to 425 degrees F.
Lightly grease a 10 inch round pie pan and set it aside. I’m pretty sure greasing it is not necessary because of the shortening in the crust, but I like to do it anyway. It helps to guarantee that the slices come out easily later. Remove the dough from the refrigerator and from the plastic wrap and place it on your floured surface. Using a rolling pin, start rolling from the center and work your way out. Sprinkle a little flour over the top of the dough and on your rolling pin if the dough is too sticky. Roll out the dough to about 12 inches in diameter. You want to roll it larger than the size of the pie pan to allow for enough dough to go up the sides of the pie plate. Carefully lift the dough off of the surface. Gently lay the dough into the pan and gently press the dough into the edges of the pan taking care to avoid poking holes in it or tearing it. 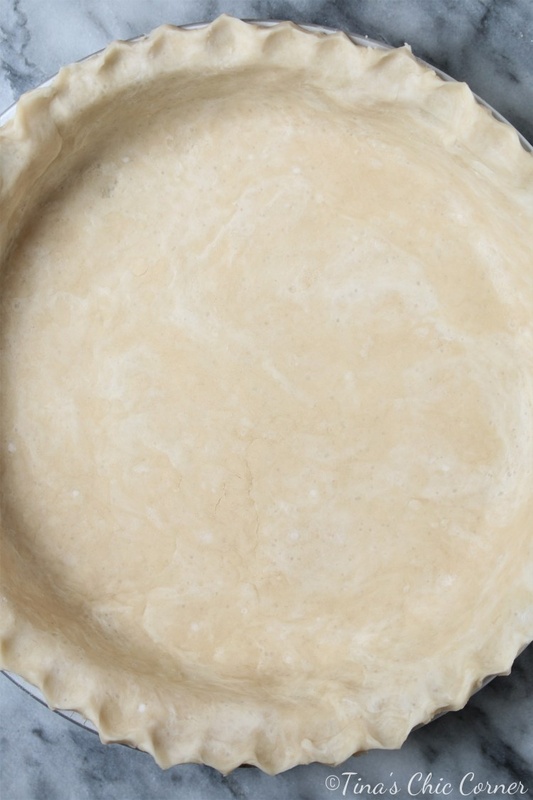 Cut off any excess dough that hangs over the edge of the pie plate. 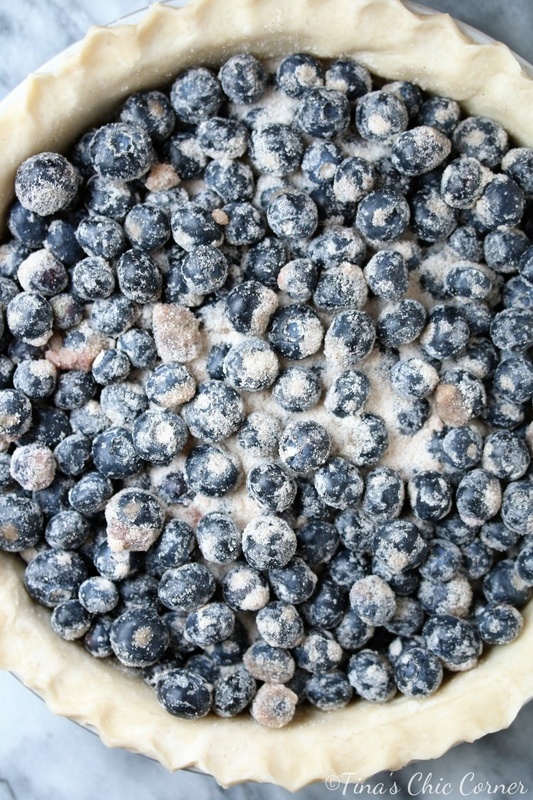 Pour the blueberry mixture into the crust. Lightly brush the beaten egg on the edge of the pie crust. Place the pie on a baking sheet. 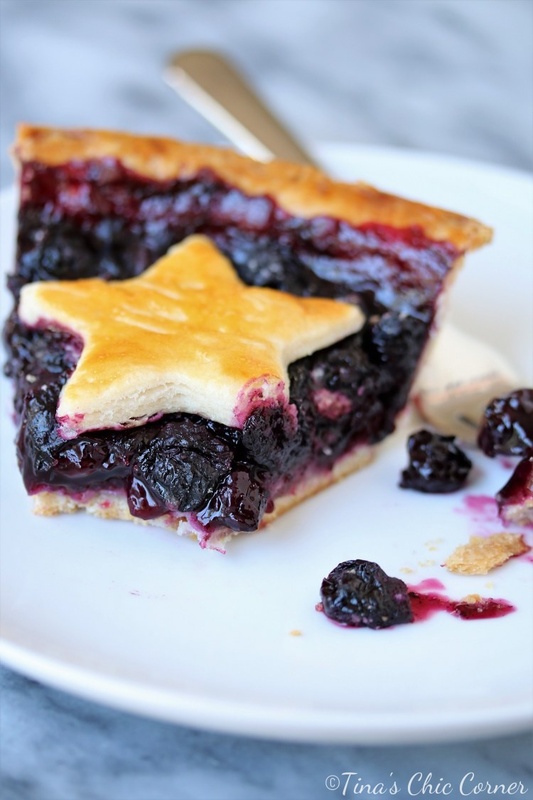 The baking sheet will catch any blueberry goo that might spill over your pie. This step only sounds silly to people that haven’t had to clean baked on fruit goo from the bottom of their ovens. Trust me on this one. Place it on the lower shelf of the preheated oven and bake for 55 minutes or until the crust is a golden brown. The blueberry goo will be giggly and bubbling like lava, but it will set once it’s cooled. Let the pie cool for a few hours before serving. I like to make it the day before so that it sets really well. Follow steps 1 through 4 from above to make the dough. Roll out the dough and cut out star shapes. Lightly brush the beaten egg on top of the stars. Use the leftover beaten egg from when you brushed the edge of the pie crust. Bake them in a 425 degree preheated oven (or toaster oven) until lightly golden brown. The size and thickness of my stars made them take about 15 minutes.